This accessible campfire ring offers a full-height outer ring as a heat barrier for the inner ring. 1" diameter draft holes feed air into the space between the rings. 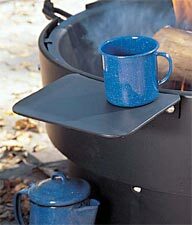 This unit does not require aggregate fill because it is equipped with a fire/log grate inside the fire ring. 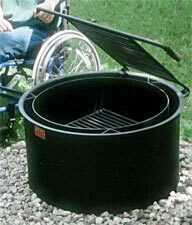 Designed to accommodate a person in a wheelchair, but all campers will find this fire ring a versatile complement to their campsite. Tip back anchor pins secure the unit in place. Fabrication includes a 1/8" thick steel outer ring with the formed reinforcing flange, and a 3/16" thick steel inner ring. Both rings are 17-3/8" tall. The 350 sq. inch single level cooking grate is permanently hinged to the outer ring. Inside is the large 445 sq. inch log grate. This log grate is hinged to the inner ring and tips up to simplify ash clean out. The cooking and fire grates are fabricated using 5/8" dia. perimeter and handle bars with coiled steel bar grips, and 1/2" dia. grate bars. This campfire ring is finished with high temp non-toxic black enamel paint. The optional utility shelf provides a handy place for condiments, utensils or pots and pans. 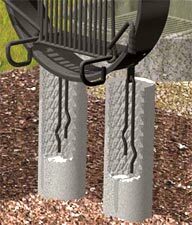 The shelf is available on most fire ring models and heat shields and will not interfere with grate adjustment. Constructed from 3/16" x 7-1/8" x 9-5/8" plate steel, the shelf is finished in high temperature black enamel paint. Fasteners are included.